This summer, Chicago teens got a chance to see six of the city’s best museums with a free All Access Pass. The Chicago City of Learning worked with the Adler Planetarium, the Chicago Botanic Garden, Art Institute of Chicago, the Peggy Notebaert Nature Museum, the National Veterans Art Museum, and Intuit: The Center for Intuitive and Outsider Art to provide a way for teenagers to visit the museums and engage in additional activities. The innovative program was funded by the Hive Chicago Fund for Connected Learning at the Chicago Community Trust. The program was aimed at teenagers, an age group that doesn’t get as many chances to visit museums through school. “If admission cost is what’s keeping teens from going, we can make an argument that they would go if museums were less expensive, and maybe museums would be willing to change their rates,” says Taylor Klassman, Project Coordinator for the Chicago City of Learning. Klassman worked with the museums to create a curriculum and activities that the students could engage with while at the museum, or later at home. “We really tried to think, 'Ok now we have teens in the museums, how can we really enrich their experience and reinforce the things they’re seeing and make them relevant for their life? '” Klassman says. 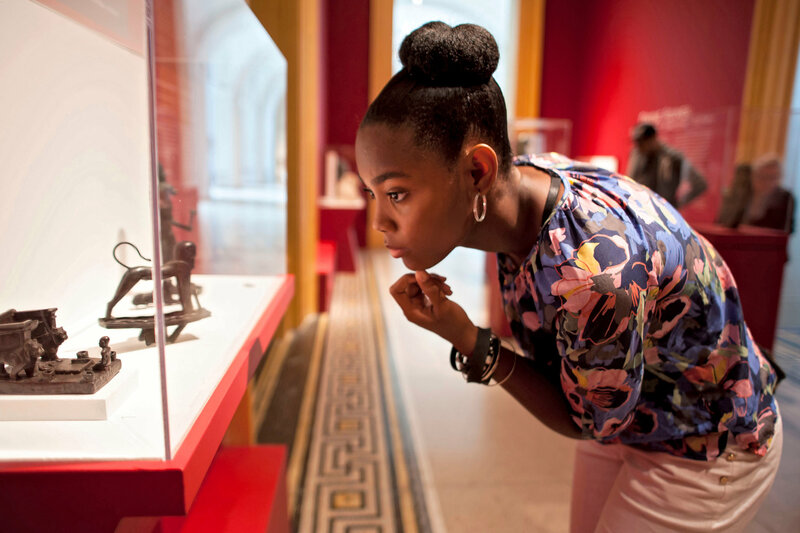 Through the activities, teens could ‘Zoom In’ to notice and record details of each museum, ‘Choose Your Perspective,’ where they would document their experience through two different perspectives, or reflect through ‘Looking Out,’ an activity aimed at understanding different ways to interact with others. Once completed, students could earn badges on their Chicago City of Learning profile. “A really cool part was that a lot of it was remixing things from the museum,” says Klassman. “Writing a story that actually relates to something happening in the city or your life, or using what you saw in the museum to do something philanthropic, for example.” At the Peggy Notebaert Nature Museum, for instance, students could look at conservation techniques and explain some of the things they saw in relationship to real changes happening around Chicago. Even if teens didn’t have time to complete activities online, Klassman says they gain a lot from just visiting the museums. “Museum designers are really talented, and they make museums interactive in and of themselves,” Klassman says. Plus, many museums host events like Q&A sessions with scientists or artists, adding to the level of engagement. Through the All Access Pass, which could be picked up at libraries around the city or at various events throughout the summer, any teenager in Chicago could visit the six museums any time they wanted. The program is funded through May 2016, and during the next phase the Chicago City of Learning will be looking at data from the museums to determine how many teens took advantage of the program, and if admissions fees are a barrier to museum visits. A previous iteration of the project took place in 2013, and Klassman says she hopes it continues in future summers. “Students get so much interaction and knowledge just by walking through the museum doors,” she says.